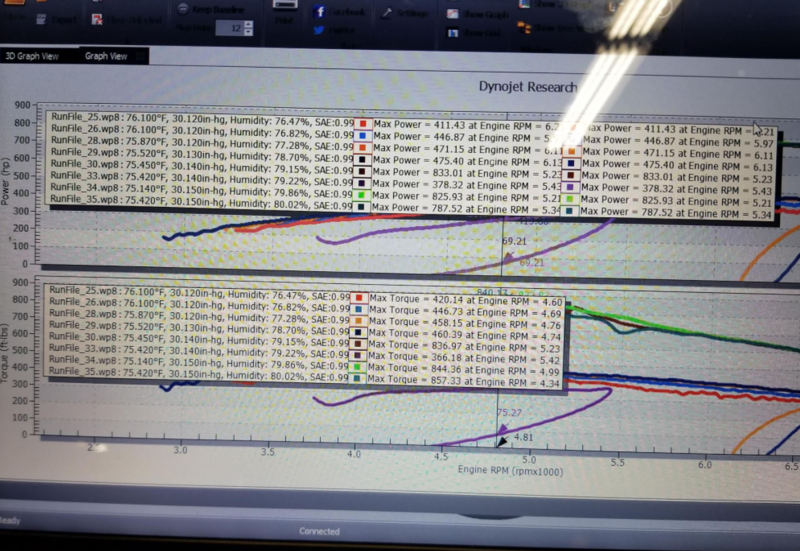 Dyno'd a customer's silverado, laid down over 830rwhp and over 850rwtq on a 402. First pull, cleaned out the fuel, was pretty lean, 13.9 afr, 22*. After some adjustments, got it down to 12.8, 31* (it's on e85) laid down 473 rwhp. We then hit it with the sauce, 400 shot. 40% starting and ramped in 1 second to a 100%. Laid down over 830 rwhp, and 830rwtq. The motor was pretty rich though, the in tank pump couldn't hold 5 psi without pushing through the regulator. 9.5 afr, pulled 16* degrees, 10 heat range plug. I leaned it out on the motor tune up, and just straight blew the tires off, hazed them on the hit. Laid down 826 rwhp, and 84x rwtq. Customer is gona go ahead and change the fuel jet to a 30 from the 32 he had, and let it eat at the track. Should be a 9 second truck no doubt. Still on the 4l60e. 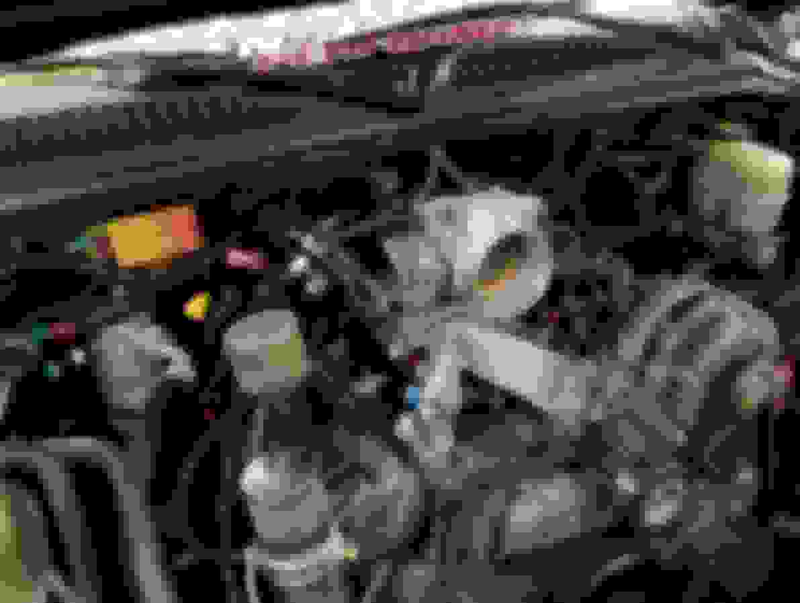 402 has 11:1 compression, stock 243 heads, vic jr, no spacer, and edelbrock elbow. Fogger was done by HSP @ houston texas, cold fusion kit. More pictures of the truck? Killer setup! Yea seems simple but works! Crazy setup! E85 does wonders for cooling the charge and helping prevent detonation. Why the 4l60? That seems like a time bomb waiting to explode . Some 823 heads would really help tht setup. Im betting the stock 243s are limiting it with tht much nitrous. Did u ever spray it any less than 400? If so how did it do/make? I will get some pictures of the truck soon once the customer sends some, I think I have a video I can link. And yea the truck really needs bigger heads, its killing the top end for sure. And well the guy builds 4l60(65s) for a living, so he thinks he has them figured out. And didn't do any nitrous hits below 400, we tried doing a 500 by upping the bottle pressure a bit but noids locked up. And yup, the right plug, e85 and c16 all helped making this tuneable! E85 in the tank with C16 in a stand alone fuel cell? Any updates on this after the jet change? The 60E still in it? How do you wind up tuning so many bad as trucks??? I feel like there must be a line of Silverados outside your shop, and none of them are messing around either! Nice to see a little break from all the turbo builds, well done.